Turn your wedding into a special occasion. 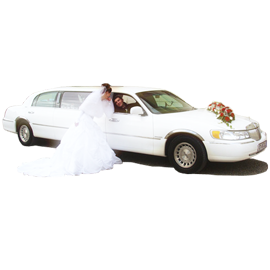 PRIME Limousines’ wedding cars are available in three different variations. You can choose what kind of car is the best for your personal day. 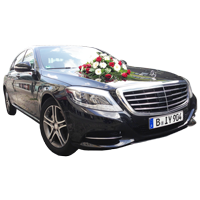 We offer an elegant Mercedes-Benz S-Class, a fancy stretch limousine or a stylish vintage car. Do you have individual requirements? We would be happy to offer you other options. The traditional wedding car is a must-have on your best day of life. You can rely on our well-organized and accurate service. Our cars can be booked conveniently as 3-hours-packages. By hiring a sedan like our long Mercedes-Benz S-Class for € 200, your appearance will show elegance and simply perfection on your wedding day. We offer romantic floral arrangements, too. 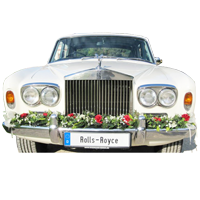 As an optional extra, we will take care of your perfect decorations onto your exquisite bridal car. Luxury services such as sparkling wine and additional time are also available for more flexibility and celebrity comfort. If you like a little bit more extravagancy, you can hire our glamorous stretch limousine which provides sufficient space inside for only € 370. If your personal style is classy, you should absolutely choose our vintage car which exudes a certain sense of nostalgia on your wedding day. Please tell us your specific wishes so your dreams can come true. Classy feeling right out of the 20s is available at a price of € 350. Optional floral arrangements, drinks and additional time are available with an extra charge, too. We make sure that your wedding day is going to be perfect.